Mercedes Corby: She still calls Bali home. Schapelle had been travelling to Bali for sister Mercedes’ 30th birthday when she was arrested with the marijuana in her boogie board bag in October 2004. Mercedes lives with husband Wayan Widyartha in his family compound in Kuta. Schapelle, under her bail conditions, will live with the couple and their three children, and cannot return to Australia until 2017. 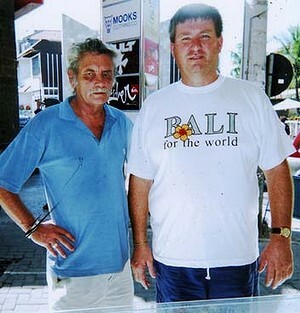 Marijuana dealer Malcolm McCauley would crow louder six months later when he told The Sun-Herald of Mick’s alleged involvement in the Bali drug trade. Mick’s cannabis possession charges in the 1970s (he insisted it wasn’t his) had been revealed before Schapelle’s conviction in Bali. But now McCauley claimed Mick was buying his hydroponic marijuana and flying it in bags that also contained $US1000 bribes for Balinese airport officials. James Kisina: Schapelle’s half-brother was ”very remorseful and committed to his family”, his lawyer said last November, when the Queenslander escaped a jail term but was fined $750 for possessing cocaine. Kisina has struggled to keep his nose clean in the years since 2004, when he was with Schapelle during her arrest in Bali. ”If the marijuana was mine, like if I did take it, I wouldn’t let my sister take the blame,” he would say later. In January 2006 – on the day Schapelle’s second appeal against her conviction was rejected in Indonesia – Kisina was arrested at his home in Loganlea over a drug-related home invasion. He had beaten a man with a baseball bat, but he would claim the victim and his partner were known drug dealers and he was trying to get information that might help Schapelle. Police also found 23 bags of marijuana weighing 183 grams and electronic scales when they arrested Kisina. ”This has ruined my case,” Schapelle’s lawyer, Hotman Hutapea, declared. Malcolm McCauley: Several people have attempted to claim ownership of, or links to, the fabled 4.2 kilograms in Schapelle’s bag. But the fact McCauley visited Schapelle in jail, and was caught trafficking marijuana to her home state at the same time as her arrest, leaves him squarely in the frame. Since his tell-all interview with Fairfax Media in 2008, McCauley has been living the quiet life in South Australia. He still stands by his story. Robin Tampoe: The Corby family’s former lawyer revealed in a documentary that he made up the ”baggage handler defence”. Shortly afterwards, he was struck off by the Queensland Law Society. However, he had exposed genuine flaws and triggered the Wheeler report, resulting in a multimillion-dollar overhaul of Australian airport security. Tampoe has since reinvented himself as a successful businessman in the United Arab Emirates. Ron Bakir: Once dubbed Schapelle Corby’s white knight, the flamboyant Gold Coast businessman now refuses to give his thoughts on Schapelle, her family or the case. Publicly anyhow. Like best friend Tampoe, the former mobile phone retailer has a new career – in property. In November he was named 2013 Gold Coast Young Entrepreneur of the Year.